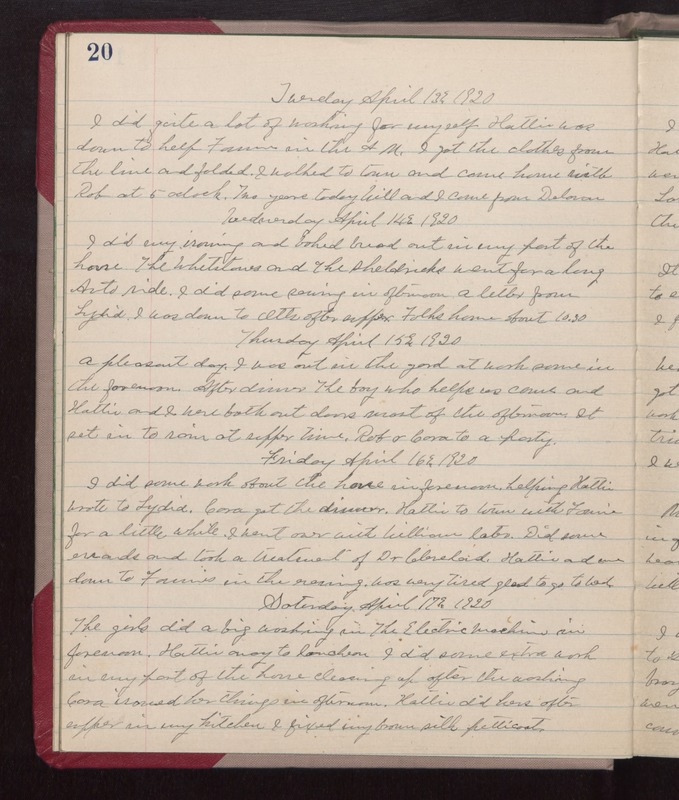 Tuesday April 13th 1920 I did quite a lot of washing for myself. Hattie was down to help Fannie in the AM. I got the clothes from the line and folded. I walked to town and came home with Rob at 5 oclock. Two years today Will and I came from Delavan. Wednesday April 14th 1920 I did my ironing and baked bread out in my part of the house. The Whetstones and The Sheldricks went for a long Auto ride. I did some sewing in afternoon a letter from Lydia. I was down to Otts after supper. Folks home about 10.30 Thursday April 15th 1920 A pleasant day. I was out in the yard at work some in the forenoon. After dinner the boy who helps us came and Hattie and I were both out doors most of the afternoon. It set in to rain at supper time. Rob & Cora to a party. Friday April 16th 1920 I did some work about the house in forenoon, helping Hattie. Wrote to Lydia. Cora got the dinner. Hattie to town with Fannie for a little while. I went over with William later. Did some errands and took a treatment of Dr Cleveland. Hattie and me down to Fannies in the evening. was very tired. glad to go to bed. Saturday April 17th 1920 The girls did a big washing in The Electric Machine in forenoon. Hattie away to luncheon. I did some extra work in my part of the house cleaning up after the washing. Cora ironed her things in afternoon.Hattie did hers after supper in my kitchen. I fixed my brown silk petticoat.